Rome has a lot to offer. Keep your money for restaurants and tours - We propose an easy way to find hotels deals in Rome. This free hotel reservation system gives you the opportunity to choose your hotels in Rome by location, price or stars . 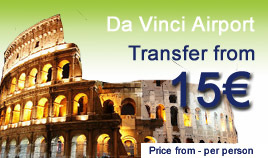 Review the selected accommodations in Rome and book online the right deal for you. Rates have been negociated and should be very competitive - Up to 60% discount in low season on the normal room rate. Find a good hotel deal in Rome - Use our booking engine to check the accommodations availability for your dates. Select the rating, the duration of your stay and the number of people and rooms.